"The more architects and planners have turned their attention to building up the City of Man apart from some vision of the City of God, the meaner and uglier the City of Man has become. "But we are now being reminded that the church people go to has an immensely powerful psychological effect on their vision of the Church they are meant to be. The church building is a prime aid, or a prime hindrance, to the building up of the Body of Christ. And what the building says so often shouts something entirely contrary to all that we are seeking to express through the liturgy. And the building will always win—unless and until we can make it say something else." I live in a place called middleurbia. Middleurbia is ten miles north of urban Austin, ten miles south of suburban Austin. My middleurban neighborhood is a mix of young, hip professionals and octogenarians who settled the once-dairy farm back in the 1950s. Pecan groves shade our homes. A public park and a swimming pool hold us together in the center. Two miles to the northwest, plans are being laid for a Wal-Mart Supercenter, a hulking 192,000-square-foot mothership. Two miles to the northeast, the city is installing a shiny new train station and surrounding it with apartments, commercial stores, and a spot of green. I can walk 12 minutes south to a coffee shop, three minutes west to a small Baptist church, 17 minutes north to a mini-mart, barber shop, deli, and acting studio. This is my middleurbian neighborhood. And the temptation is to think that it's "just" my neighborhood, "coincidentally" set in the city of Austin. 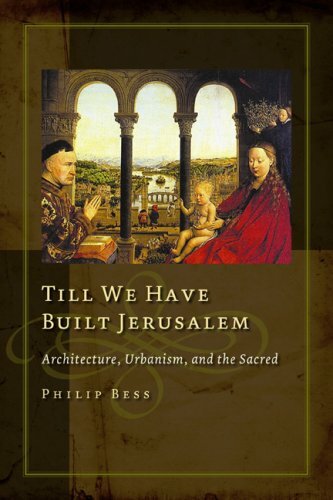 But Philip Bess rebukes my wrong thinking, suggesting not only that God cares deeply about cities but also that he has a few good ideas about what it would take to build a good one and to live in it well.